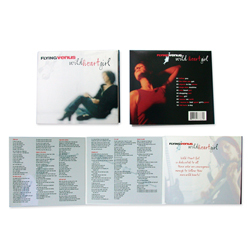 Jean Mazzei, the genius singer-songwriter behind Flying Venus needed an attention grabbing packaging for her debut CD. Using rock design techniques and strategies, Kat Georges Design took charge, making it a top seller on CDbaby.com. And just check out the interior of this green-friendly, no-plastic design, with all those great lyrics.